DGH data acquisition modules are compatible with National Instruments Labview software. Connecting any DGH ASCII protocol or Modbus RTU protocol module to Labview is easy using the sample VI's (Virtual Instruments) provided below. Each downloadable VI contains the front panel graphic user interface (GUI) and the block diagram designed to communicate with the modules. The front panel GUI is easily customizable and the block diagrams can be modified to build more complex applications. Kepware is the world leader in communication software for automation and offers a unique experience in both OPC and embedded device communications. Since 1995, Kepware has focused on the development of communication drivers to automation controllers, I/O and field devices. Applications include M2M (Machine to Machine) and M2E (Machine to Enterprise) communications. Operating system support includes; Microsoft Windows Desktop, Windows Server and Windows Embedded (Windows CE and Windows Embedded NT/XP). Dream Report™ is taming that ocean of data! It’s the first programming free, user-friendly, automated reporting and data analysis software designed specifically for industrial automation applications. It is designed to be the simplest solution for extracting data from virtually any data source and Dream Report will provide automated reports to anybody, anywhere and any time. Click to more information about DreamReport. WinWedge captures serial data, custom tailors it to your needs, then transfers the data to any Windows application - either by sending keystrokes to the application’s window or by passing the data through DDE (Dynamic Data Exchange) conversations. 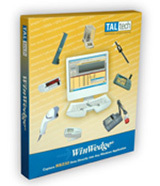 WinWedge makes it very easy to input real-time data directly into EXCEL, ACCESS, LIMS, MMIs, Statistical and Math software, VB, etc... any Windows 3.x, 95, 98, 2000, or NT application program. Click here to download sample configuration files. DAQFactory is a PC based HMI / SCADA / data acquisition software tool designed specifically for smaller systems (say, under 3000 tags), resulting in an easier to use and more affordable solution. DAQFactory software installations around the globe include applications in aerospace, automotive, agriculture, energy, power distribution, building management, manufacturing, water and wastewater, irrigation, mining, military, scientific and technology research, and education. Get started with your Modbus compatible DGH modules today. DASYLab is a data acquisition software program designed for users who want to get started right away with no programming effort. DGH offers DASYLab in three versions: Lite, Basic and Full. DASYLab Lite provides capability for up to 32 data acquisition points with limited math, control and display functions. DASYLab Basic and DASYLab Full offer greater capabilities in data acquisition points with expanded functions. Click to more information about the DASYLab packages. DGH offers several software options for program developers who want to quickly integrate DGH connectivity into a custom data acquisition program. Sample programs with source code are available in different programming languages such as MS-Visual Basic and MS-Visual C++. ActiveX objects and a dynamic link library are also available. DGH offers ActiveX objects that support the DGH ASCII protocol commands: AO, DI, DO, RD, RE. The ActiveX controls allow easy implementation of DGH ASCII protocol within programming environments such as Visual Basic. Click here to download the ActiveX controls and documentation. A callable dynamic-link library (.DLL) is also available that performs all the serial I/O handling and supports many of the DGH ASCII protocol commands. Click here to download the dynamic link library. Click here to download sample software. DGH offers "free" utility software for configuring our analog and digital I/O products. The utility software runs on MS-Windows computers. The Utility software is available from DGH free of charge and shipped on CD-ROM with each order. The Utility software is also available for download from our website. Click here to download the latest version of the Utility Software. Click here to the entire list of device drivers, program samples, and controls.